Hi - this is a funky card. I love the director's chair, clapper board and film strips on the tags. Thanks for your interesting take on our sketch and for playing along at Feeling Sketchy this time. Hudo dobra. Super voščilnica za filmsko navdušenko. Super card! 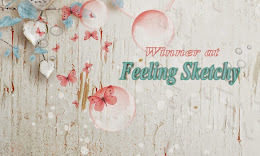 Thanks for sharing this beauty with us at the Feeling Sketchy challenge #144. Good luck, and please join us again soon. Great work with our sketch!! Thanks for playing along at Feeling Sketchy! !